The Valve & Process Solutions team are celebrating two milestones this month. We have taken on an additional 1900 sq foot warehouse next to our existing building, increasing our footprint two-fold. And annual turnover has doubled in the last twelve months, driven by an increase in exports to meet worldwide demand. 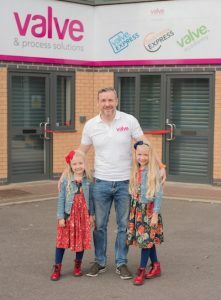 Steve Pearson, founder and managing director, commented, “Three years ago, when we moved into our existing unit, our business employed four people and now we have a team of ten. “And in the past 18 months we’ve moved from doing no international business whatsoever to doing business in 28 countries. It’s a huge testament to our engineers’ knowledge and experience in real-world solutions: customers come to us for advice and to solve challenges. Valve & Process Solutions is the world’s largest stockist distributor for Westlock products and the sole UK Agent for SchuF. We supply individual products and our engineers build ready-to-use, combination solutions for customers’ specifications.